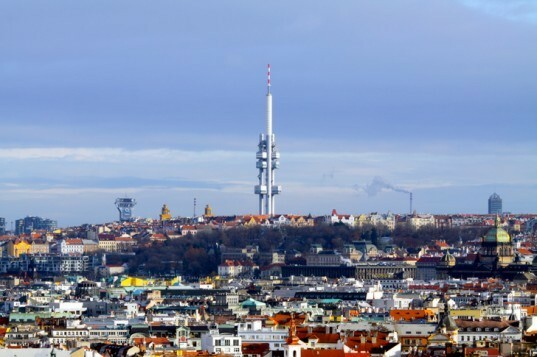 The Žižkov Television Tower in Prague is considered by many to be an eyesore, but that wasn't enough to deter the One Room Hotel from setting up shop 230-feet above the city streets. In contrast to the communist-era designs of the exterior, the hotel room features contemporary design, luxury furnishings, and modern technology. Keep reading to find out about the tower's strange history, which includes numerous babies climbing up its side. Visitors to the hotel can also get a different perspective of the city from the observatory located at the tip of the tower. For food and other culinary delights, the Oblaca restaurant is located one floor down. And for added luxury, the hotel will prepare a festive decorated table for a private dinner or lunch of up to 16 guests, which can also include a private waiter and sommelier. The only thing that might justify the $900 per night price tag, is a glass-walled bathroom that lets you relax in style and peer out over the city skyline from your secluded hideaway. While it would certainly make for a unique experience, the room itself doesn’t have any other standout features – unless you include the option to convert it into your very own private conference room, in which case there’s that. Originally constructed in the 1980s, the tower consists of three concrete pillars with a metallic finish, and has nine different ‘pods’ scattered across it’s surface. The television tower still houses transmission equipment, which was supposedly used to jam communications from the west during the country’s communist occupation. Criticism of the building’s appearance was strictly prohibited during its earliest days, but in an attempt to try and improve the building’s public image at the turn of the century, Czech artist David Černý was invited to infuse the tower with some public art. He settled on giant metallic babies crawling up and down the side of antennae; they were removed at one point, but after enormous public outcry, they were quickly reinstated. Criticism of the building's appearance was strictly prohibited during its earliest days, but in an attempt to try and improve its public image at the turn of the century, Czech artist David Černý was invited to infuse the tower with some public art. He settled on giant metallic babies crawling up and down the side of the antenna, and even though they were removed at one point, public outcry meant that they were quickly reinstated. While it would certainly make for a unique experience, the room itself doesn't have any other standout features – unless you include the option to convert it into your very own private conference room, in which case there's that. Visitors to the hotel can also get a different perspective of the city from the observatory located at the tip of the tower. For food and other culinary delights, the Oblaca restaurant is located one floor down from the hotel. If there is one thing that might justify the $900 per night pricetag, it's a glass-walled bathroom that lets you relax in style, and look out over the city skyline from your secluded hideaway. The hotel can prepare a festive decorated table for a private dinner or lunch of up to 16 guests, which can also include a private waiter and sommelier. The television tower still houses transmission equipment, which was supposedly used to jam communications from the west during the country's communist occupation.